don't think so. At least, it is definitely my one of my favourite films of that genre. Not because a delicate love story is weaved around the incident of memory loss, but because the way the happenings following the retrieval of the lost memory brings together the man and his wife is really commendable. There are heartbreaks, anticipations, misunderstandings and tension galore, but what triumphs in the end is true love. And that's what really makes the journey of these separated lovers so special. But the happiness is short-lived.While going to the post office one day, Alok meets with an accident. Immediately, his memories of his past comes rushing back and Roma and his present life slips into darkness. When Roma's servant calls out for him on the road, he shrugs him off with a "who are you and how dare you call me" look. Might I add that no-one else in the Bengali film industry so far has been able to get this look! 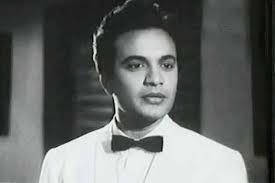 Yes, Uttam Kumar made this smugness his signature and he pulled it off with so much panache. So, while the servant is left wondering why he was given a cold shoulder, Alok hails a cab and go to his actual home. the array of emotions in their minds), the film is a celebration of love and its power. And of course it is a treat for all Uttam-Suchitra fans. Kumar is fascinating to watch. He starts off being the distraught patient but is soon the man on whom all eyes are set. The turmoil he goes through when he is near Roma is so well etched in his eyes. He feels a pull towards her, but knows that she is forbidden fruit. Then what is this attraction he has towards her. What are these faint memories that his mind is suffused with whenever she is near him. Why on earth is this woman working as a governess when she could easily be a doctor. Is she playing tricks with his mind? Kumar and his vast reserve of emotions will compel you to fall in love with him. @Dustedoff: If I may say so, there will be no couple like them ever :) Please please watch this. Coming here after a really long time,I hardly get the time to blog hop. I now manage 2 blogs. How are you? 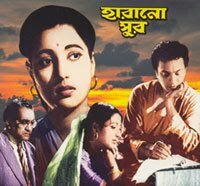 Harano Sur is one of my favourite Bengali films and that song Tumi Je Aamar is an all time favourite, they don't make songs like this anymore. 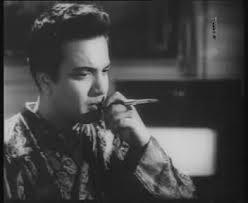 You've introduced me to this pair, and to Uttam Kumar in a big way, so that now Uttam Kumar is one of the actors I find very good looking, and I'm sure very good in acting to - just have to see more of his Bangla films - with subtitles. I did manage to find at least a couple of films I read about here. Will go on a search to find a subtitled version on line. @Pacifist: You must get hold of this one. It's one of their best films together! What a mouth watering review! Harano Sur does look like a must-see! 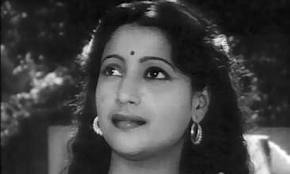 And I definitely have to watch more of Suchitra Sen!! @Anonymous: I think you just hit the nail on the head!! This is easily and by far the best film of Suchitra Uttam duo. The story is gripping, minimum melodrama and superb acting and music. What more can you want ? Though I hardly have the patience to sit through an entire movie nowadays, I have watched this one at least 10 times and it always looks new. In my opinion this is easily the most lovable of the movies by Uttam Suchitra duo. A gripping plot, great acting, haunting music and very little melodrama. What more can one ask for ? Nowadays I hardly ever have the patience to sit through an entire movie but I have watched this one at least 10 times and it still feels new and fresh. These reviews are so nice ,like a fine dessert after a gourmet meal. I have no words to describe the feelings of love sublime I experience whenever I watch this movie. 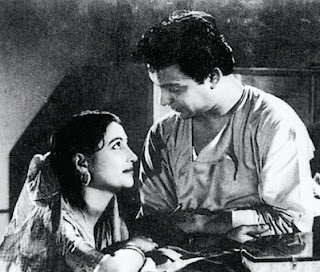 Uttam and Suchitra are a pair from the DEVLOK. Can I request for a review of Bhranthi Bilas in this blog please?